Port Authority of Allegheny County riders can now view real-time locations for the P1 East Busway-All Stops bus route through the agency’s website. This is the initial testing and demonstration phase of the real-time arrivals system. This initial phase will be limited to only the P1 route and only those buses on the regular route. 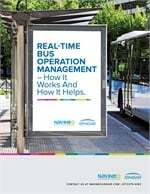 The transit system expects to begin installing additional equipment and rolling out real-time capability to additional routes in early 2014. The project will proceed in phases, with a goal of having most of the bus system covered by 2015. Additional real-time system features will also be introduced in phases. For example, open data for developers and tracking of detoured routes will be available at a later date. Real-time for Port Authority’s T system will be implemented separately since the light rail vehicles do not currently use GPS-enabled signs and annunciators — instead, a light rail vehicle’s position is announced when the vehicle passes over certain points on the tracks. Currently, real-time arrival information for the P1 is only available online, but starting next month, the agency will install electronic countdown signs at select locations along the Martin Luther King Jr. East Busway.